(PUBPlough)Reissue! Blumhardt berates the lukewarm Christian for not practicing his or her faith seriously in this suffering world. We must take part in the coming kingdom instead of standing behind walls of religious respectability; abandon our old sinful habits; and be clothed in Christ's resurrected joy. 256 pages, softcover. Ours is a time of intense searching. Few of us are satisfied with what the church and society have served up. The honest among us will readily admit we lead fractured lives -- with a disembodied spirituality on one side, and a soulless daily existence on the other. We are desperate for something more, for a faith with the power to transform both ourselves and our world. Enter Christoph Blumhardt. With unabashed clarity of focus, Blumhardt's words cut through the clutter of our post-modern existence. He offers a concrete vision that inspires even the most disillusioned. His enthusiasm rekindles our passion to live a life of purpose. Action in Waiting is not abstract theology -- it's too blunt, too earthy, too real. These seventeen essays reflect the gripping reality of the living Christ. They give us a fresh look at the spiritual life as one of "active expectation" of God's kingdom breaking into this world. Blumhardt shows us that the object of our hope is no longer relegated to some afterlife, but takes effect today. Blumhardt tells us how we can experience the future Christ promised now, in such a way that death and human misery are overcome. In his life, he experienced God's saving actions every day. Demons were cast out, sick were healed, and sinners turned from evil. Action in Waiting shatters the walls of institutional Christianity. Having been both a pastor and a politician himself, Blumhardt was qualified to say, "State and church are no soil for the fire of God". All human institutions stand in the way of God's kingdom. "Nothing is more dangerous than a religion: for that is what makes us heathens...God does not care a fig for our religion". 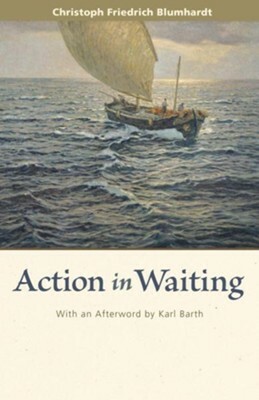 Action in Waiting carries an afterword by Karl Barth, one of several great spiritual thinkers of our century whom Blumhardt influenced. I'm the author/artist and I want to review Action in Waiting.